1. Amanita morrisii, Pakim Pond, Brendan T. Byrne St. For., Burlington Co., New Jersey, U.S.A.
2. Amanita morrisii, Pakim Pond, Brendan T. Byrne St. For., Burlington Co., New Jersey, U.S.A.
3. 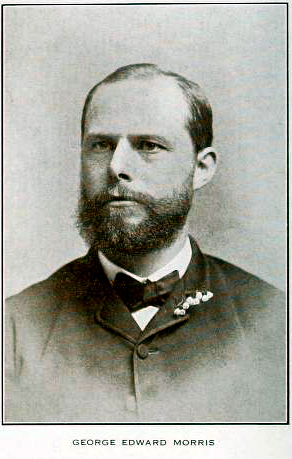 George E. Morris, from frontispiece plate in (A. P. Morse 1918). 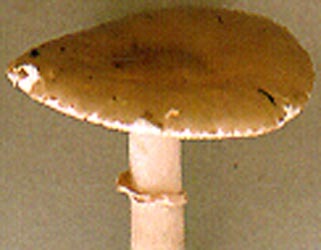 The cap of Amanita morrisii is 45 - 95 (-114) mm wide, dark grayish brown to blackish brown becoming paler brownish gray with age, sometimes remaining darker over the center until nearly fully expanded, sometimes becoming virgate upon partially drying, subcampanulate becoming broadly convex to planoconvex, with flattened umbo, sometimes with a depression in the center, sometimes glistening when moist, tacky to viscid when moist, with a usually nonstriate margin, sometimes with short striations in age, sometimes splitting, nonappendiculate. The volva is absent or present as irregular, submembranous to friable patches or confluent groups of warts, off-white to pale brownish gray, minutely granular. 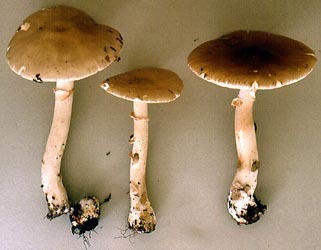 The flesh is white, sometimes pale umbrinous under the cap skin, sometimes with watersoaked line above the gills, 5 - 8 mm thick above the stem, and thinning evenly to margin. The gills are free to narrowly adnate, close, white in mass and in side view, becoming primrose yellow quickly during force air drying and then becoming paler, 6 - 10.5 mm broad, broadest at about three-quarters radius from stipe, thin, with rather straight edge, sometimes with marked decurrent tooth, with long decurrent line on stipe apex. The short gills are rounded truncate to subattenuate to rounded attenuate, of diverse lengths, unevenly distributed, and plentiful. The stem is 95 - 153 × 10 - 15 mm, white, sometimes pale gray to pale brown above the ring, white at the top of the stem, cylindric or narrowing upward, satiny to slightly floccose or fibrillose below the ring, darkening somewhat on these surface fibrils from handling, with longitudinal striations. The bulb is clavate to subglobose, sometimes doglegged, 18.5 - 38 × 18 - 38 mm. The ring is membranous, persistent, superior, collapsing, white and striate above, smooth and pink to pinkish to pale orangish buff or pale ochraceous buff below. The volva is present in whitish to pallid grayish patches on the lower stem or upper part of the bulb, easily left in the soil or lost during collecting. The flesh is white at least near center, sometimes pale gray or pale brown toward surface, becoming bright primrose yellow (at least near the top of the stem and in bulb) when rapidly dried (forced air dryer), solid or stuffed. The odor of this species is noticeably fruit-like (at least to RET). The spores measure (6.0-) 7.2 - 9.8 (-11.5) × (4.2-) 5.5 - 7.0 (-8.2) µm and are broadly ellipsoid to ellipsoid (infrequently subglobose or elongate) and amyloid. Clamps are absent from the bases of basidia. Note the pale orange-beige tint on the bottom of the very narrow annulus and on the stipe below the annulus. Young buttons have caps that are almost black. This species occurs in wet areas from Maine to New Jersey and probably in neighboring regions. The specimens in the photograph were found in New Jersey Pine Barrens in wet sand by a pond. author Peck. 1910. Bull. N. Y. St. Mus. 139: 42, pl. W, figs. 1-4. ≡Venenarius morrisii (Peck) Murrill. 1913. Mycologia 5(2): 75. ≡Amplariella morrisii (Peck) E.-J. Gilbert. 1940. Iconogr. Mycol (Milan) 27, suppl. (1): 78.
etymology genitive of Latinized name, hence, "Morris'" or "of Morris"
revisions Tulloss. 1991. Mycotaxon 40: 281, figs. 1-3. Note: The revision of this species including revision of the type and other material collected by Morris was published prior to the development of the current methodology of RET; hence, there are gaps in the data which are marked as follows: ??. pileus 45 - 95 (-114) mm wide, dark grayish brown to blackish brown becoming paler brownish gray with age, sometimes remaining darker over disc (e.g., dark grayish brown to bister) until nearly fully expanded, sometimes becoming virgate upon partially drying in situ, subcampanulate becoming broadly convex to planoconvex, with flattened umbo (sometimes having central indentation), sometimes glistening when moist, tacky to viscid when moist; context white, sometimes pale umbrinous under pileipellis, sometimes with watersoaked line above lamellae, 5 - 8+ mm thick above stipe, thinning evenly to margin; margin usually nonstriate, sometimes with short striations in age, sometimes splitting, nonappendiculate; universal veil absent or as irregular submembranous to friable patches or confluent groups of warts, off-white to pale brownish gray, minutely granular (10× lens); pileipellis separable, umbrinous in cross-section in specimens with darkest pilei. lamellae free to narrowly adnate, sometimes with marked decurrent tooth, with long decurrent line on stipe apex, close, white in mass and in side view, becoming primrose yellow quickly during force air drying and then becoming paler, in older collections 5B5-7 to 6B5 to 6B8 to 6C4 to 6D8 to 5YR 5-6/8 to 10YR 6/8, 6 - 10.5 mm broad, broadest at about three-quarters radius from stipe, thin, with rather straight edge; lamellulae rounded truncate to subattenuate to rounded attenuate, of diverse lengths, unevenly distributed, plentiful. stipe 95- - 153 × 10 - 15 mm, white, sometimes pale gray to pale brown above annulus (in region with lines decurrent from lamellae), but then white again at apex, cylindric or narrowing upward, satiny to slightly floccose or fibrillose below partial veil, darkening somewhat on these surface fibrils from handling, longitudinally striatulate; bulb clavate to subglobose, sometimes doglegged, 18.5- - 38 × 18- - 38 mm; context white at least near center, sometimes pale gray or pale brown toward surface, becoming bright primrose yellow (at least near apex and in bulb) when rapidly dried (forced air dryer), solid or stuffed, with central cylinder 3 - 4 mm wide; partial veil membranous, persistent, superior, but low enough on stipe so margin at first flaring upward from tension of expanding pileus, then standing straight out from stipe, eventually collapsing, of short radius, white and striate above, smooth and pink to pinkish to pale orangish buff or Pale Ochraceous Buff (1YR 8.2/5.0) below; universal veil in whitish to pallid grayish patches on lower stipe or upper part of bulb, easily left in the soil or lost during collecting. odor/taste Odor of apples (Tulloss 10-9-83-B, -C, -D1, -D2) or fruity to anise-like (Tulloss 10-15-95-B).&nsp; Taste not recorded. tests Spot test for laccase (syringaldazine) - negative throughout basidiocarp. Spot test for tyrosinase (paracresol) - positive (faintly after 1 min., strongly after 10 min.) throughout basidiocarp except on lamellae surfaces and in bulb of stipe. Test voucher: Tulloss 10-15-95-B. pileipellis 100 - 180 µm thick; suprapellis 20 - 65 µm thick, comprising criss-crossed filamentous, undifferentiated hyphae loosely interwoven in gelatinous matrix; subpellis 80 - 115 µm thick, comprising filamentous, undifferentiated hyphae closely packed vertically, with more hyphae subradially arranged than in suprapellis, with orange-brown intracellular pigment; filamentous, undifferentiated hyphae 1.9 - 10.5 µm wide, branching; vascular hyphae 3.0 - 11.0 µm wide, tangled or occasionally coiling, sordid yellow to sordid orangish brown. pileus context filamentous, undifferentiated hyphae 1.2 - 10.0 µm wide, branching; acrophysalides ellipsoid to ovoid (to 81 × 51 µm) or clavate (to 110 × 38 µm), thin-walled; vascular hyphae 6.0 - 11.2 µm wide, unevenly distributed, locally common, branching, tangled, coiling. lamella trama bilateral, divergent; wcs = ?? µm; subhymenial base comprising elongate intercalary cells (e.g., ?? × ?? µm); central stratum including partially inflated intercalary cells (e.g., 58 × 15.0 µm)?? ; in ? ?well-rehydrated material, angle of divergence 30°±?? filamentous, undifferentiated hyphae 1.2 - 8.8 µm, dominating, interwoven, branching; inflated cells clavate, to 90 × 25 µm, thin-walled, not uncommon but sometimes hidden in tight mesh of filamentous hyphae; vascular hyphae 1.2 - 9.7 µm wide, branching, rather common, often found in region immediately below subhymenium or even in subhymenial region ?? [The last observation suggests such hyphae may belong to a mold and not be vascular hyphae.]??. basidia 24 - 47 × 7.8 - 12.5 µm, 4-sterigmate, with sterigmata up to ?? × ?? µm, thin-walled; clamps not observed. stipe context longitudinally acrophysalidic; filamentous, undifferentiated hyphae 1.8 - 8.0 µm wide, branching; acrophysalides plentiful, to 302 × 57 µm; vascular hyphae 1.2 - 14.8 µm wide. partial veil filamentous, undifferentiated hyphae 1.2 - 11.2 µm wide, frequently branching, dominating, with narrowest branching somewhat less frequently and more often radially arranged, overall with appearance of directionless tangle; inflated cells terminal on hyphae of largest diameter, scattered, sometimes clustered, thin-walled, barely inflated to elongate to clavate to ellipsoid, to 143 × 50 µm; vascular hyphae 1.5 - 4.2 µm wide, branching. 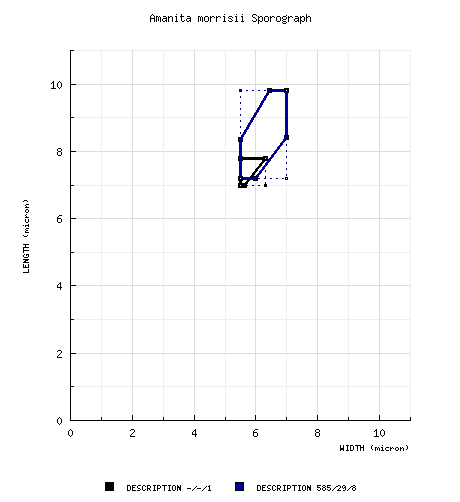 lamella edge tissue sterile; t.b.d..
from type study of Jenkins (1978a): [-/-/1] 7.0 - 7.8 × 5.5 - 6.3 μm, (Q = 1.24 - 1.42; Q' = 1.27), hyaline, thin-walled, amyloid, broadly ellipsoid to elipsoid, often adaxially flattened; apiculus sublateral, cylindric; contents guttulate; color in deposit not recorded. RET: [585/29/8] (6.0-) 7.2 - 9.8 (-11.5) × (4.2-) 5.5 - 7.0 (-8.2) µm, (L = (7.4-) 7.9 - 9.1 (-9.3) µm; L’ = 8.5 µm; W = (5.5-) 5.9 - 6.6 (-6.7) µm; W’ = 6.3 µm; Q = (1.11-) 1.20 - 1.52 (-1.64); Q = (1.28-) 1.30 - 1.42 (-1.44); Q’ = 1.36), hyaline, colorless, thin-walled, smooth, amyloid, broadly ellipsoid to ellipsoid, rarely subglobose, rarely elongate, sometimes swollen at one end, adaxially flattened; apiculus sublateral, small, cylindric; contents granular to multi- or monoguttulate; white in deposit. ecology Solitary, in pairs, or subgregarious. Maine: ??. Massachusetts: In "black vegetable mold" among mosses of swampy area (Natick collections) or in Chamaecyparis thyoides swamp (Barnstable Co. (Cape Cod) collection). New Jersey: In wet sand (poor in organic matter) of Pinus rigida-Quercus barrens, occasionally with Thuja occidentalis nearby, with soil surface barely above level of nearby pond or lake. material examined from type study of Jenkins (1978a): U. S. A.: MASSACHUSETTS—Middlesex Co. - Natick, ix-x.1909 G. E. Morris s.n. (holotype, NYS). RET: U.S.A.: MAINE—Cumberland Co. - NW of Windham, Sebago Lk., 25.ix.1995 G. Marshall s.n. (RET 160-5). MASSACHUSETTS—Barnstable Co. - Marconi Stn., White Cedar Swamp Tr. [41°42'13.72" N/ 69°58'51.65" W, 4 m], 8.x.1995 G. Lincoff et al. s.n. (RET 160-7), 16.x.2009 Noel Rowe s.n. [Tulloss 01-16-09-B] (RET 448-5, nrITS seq'd. ); Provincetown, ca. Provincetown Airport, by natural cranberry bogs [42°04'32.35" N/ 70°13'00.82" W, 2 m], 18.x.2008 Noah Siegel s.n. (RET 425-3, nrITS seq'd. ), 31.x.2008 N. Siegel s.n. (RET 425-7). Essex Co. - Lynn, Lynn Woods, 1.x.1927 Mrs. S. C. Pierce s.n. (NY). Middlesex Co. - Natick, 11-13.ix.1909 G. E. Morris s.n. (paratype, PM, with watercolor no. 33; paratype, RET 044-5, on long term loan), 13.ix-1.x.1909 G. E. Morris s.n. (holotype, NYS; isotypes, CUP-A (three separate portions); isotype, NCU), 1.x.1909 G. E. Morris s.n. (paratype, CUP-A “part of type, pale form”), 13.x.1909 G. E. Morris s.n. (paratype, PM), 23.ix.1910 G. E. Morris s.n. (PM, watercolor no. 34 without voucher), ix.1911 Mrs. Eliza B. Blackford s.n. (FH). NEW JERSEY—Burlington Co. - Brendan Byrne (a.k.a. Lebanon) St. For., Pakim Pond [39°52’47” N/ 74°31’59” W, 33 m], R. E. Tulloss et al. 10-15-95-B (RET 158-8), 26.x.1997 George Orsino s.n. [Tulloss 10-26-97-C] (RET 271-7), 26.x.2008 NJMA foray participant s.n. (RET 425-4), Patrick Bernardo s.n. (RET 445-10, nrITS & nrLSU seq'd. ), R. E. Tulloss et al. s.n. (RET 447-8), 23.x.2011 NJMA foray participant s.n. [Tulloss 10-23-11-B] (RET 504-3); ca. Chatsworth, Franklin Parker Preserve, 30.x.2009 John & Nina Burghardt s.n. (RET 450-2); ca. Chatsworth, Franklin Parter Preserve, "Railroad East" section, 12.x.2009 J. Burghardt, F. Wartchow & R. E. Tulloss [Tulloss 10-12-09-C] (RET 449-5, nrLSU seq'd. ), 25.x.2012 unkn. coll s.n. (RET 555-4); Penn St. For., Oswego Lk. [39°44'03.86" N/ 74°19'26.41" W, 17 m], 9.x.1983 Aaron Norarevian, Eugene R. Yetter & R. E. Tulloss 10-9-83-D1 (RET 353-7, nrITS seq'd. ), -D2 (RET 353-8). Ocean Co. - ca. Lakehurst, S. of Eisenhower Circle, unkn. park, 2.x.1988 A. Noraravian & E. R. Yetter s.n. [Tulloss 10-2-88-A] (RET 672-6, nrITS & nrLSU seq'd. ); National Pinelands Preserve, East Plains area, W of Co. Rte. 539, by pond E of gate in old military target area, 9.x.1983 A. Norarevian, E. R. Yetter & R. E. Tulloss 10-9-83-B (RET 352-3), -C (RET 352-4) NEW YORK—Oneida Co. - btwn. Lake Delta and Westernville, ca. Townline Rd. [43.279° N/ 75.416° W, 202 m], 2.ix.2012 Eric Smith s.n. (RET 529-2). discussion This species is usually found in damp to wet soils, which is an unusual environment for an Amanita. from Tulloss (1991): "In addition to the anatomy of the lamellae and the size and shape of the spores, the colored underside of the annulus and the very dark pileus of young specimens becoming paler with age should clearly distinguish A. morrisii. "Dr. John H. Haines (NYS) was extremely helpful in locating the list of Morris’ watercolors (Morse, 1918) and [preserved in NYS]. For example, while Peck did not publish dimensions of A. morrisii in the protolog, one can get information by measuring Morris’ spore prints (PM) and from Morris’ letter to Peck dated 1 October 1909—the only reference to size of A. morrisii I have found. This correspondence also indicates that Peck originally intended to call the mushroom “A. bicolor” because of the stark difference between the dark pileus and the pallid colors of the rest of the basidiocarp (letter of Peck to Morris of 14 September 1909 in FH), but changed the name to honor the collector—over Morris’ objections. Apparently Morris had already announced to his colleagues in the Boston Mycological Club the first-proposed name. "Morris makes reference to a collection made in Needham, Massachusetts by a Miss Hibbard; this collection apparently made its way to W. G. Farlow to the consternation of Morris who would appear to have been very protective of Peck’s priority in naming of fungi and as the preferred mycological guru of the age (letter of Morris to Peck, 4 October 1909 in NYS). I have been unable to locate the Hibbard collection. "Excellent watercolors of A. morrisii by George E. Morris are located in NYS and PM. From Morris’ letter of 28 November 1909 (NYS), it is clear that the painting in NYS (marked 1-1032 in the upper right hand corner) is not drawn from fresh material. In the cited letter, Morris expresses surprise that Peck thought he had already asked for such a painting; Morris promises to send the painting as soon as his busy teaching schedule allows. He was a secondary school art teacher. In the extensive Morris collection at PM, the A. morrisii paintings are numbers 33 and 34. For number 33, a voucher collection has been identified in PM. It is noteworthy that the underside of the annulus in the paintings drawn from fresh material is distinctly pink while in the painting at NYS there is a faint brownish tone added making a pale orangish beige that Peck called “buff” in the protolog. Mrs. E. B. Blackford also painted A. morrisii (Blackford watercolors numbers 26 and 27 in FH); she was the lesser of the two painters as a botanic illustrator; but her colors are in good agreement with Morris’ including the pink tinge on the annulus, which she sometimes shows on the top margin and sometimes on the bottom. "In letters to Peck dated 4 October and 14 November 1909 (NYS), Morris mentions planning to send and having sent fragments of A. morrisii to William W. Ford for Ford’s studies of poisons in mushrooms. 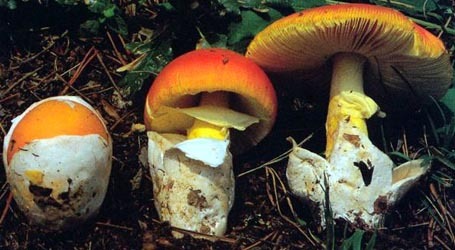 The results of injecting extracts of A. morrisii in animal subjects led Ford to conclude that the species was poisonous (Ford, 1911; Ford & Clark, 1914). The analytical techniques of the time were such that Ford could determine that there was an hemolytic agent that was destroyed by heating to 60° - 65° C. His experiments with guinea pigs and rabbits indicated that there was also a heat stabile, deadly poison present that deteriorated in potency over a period of eight to nine months. It must be taken into account that Ford admits his animals sometimes died for reasons other than injections of mushroom extracts. To my knowledge, there have been no subsequent studies of the possibility of poisons in A. morrisii. "The Morris collection dated 11-13.ix.1909 (PM) and the holotype (NYS) are both mixed collections. One of the basidiocarps in each collection is not conspecific with the remainder. Possibly these two (globose-spored) specimens represent A. brunnescens Atkinson. The possibility of confusion with the rather common A. brunnescens should be minimal today because its nearly globose spores and distinctive, cleft bulb are widely described in field guides and are easily recognized." "The collection of C. H. Kauffman...which [is] briefly described by Gilbert (1940-41) [has] very different coloring from that of A. morrisii—bright yellow or chrome universal veil.... I did not locate a collection that might be the voucher for the photograph supplied to Gilbert by Smith (Gilbert, 1941: tab. 50); the distribution of universal veil in rings on the lower stipe as seen in that picture was present on the Lynn Woods collection here accepted as A. morrisii." photo RET - (1-2) Pakim Pond, Brendan T. Byrne State Forest, Burlington County, New Jersey, U.S.A.
historic plates frontispiece plate in (A. P. Morse 1918) - (3) George Edward Morris.